The display at the adjacent Peter Hay Hill Golf Course will include a chance for attendees to drive Cadillac’s performance cars such as the 2013 ATS 2.0 T and 2013 CTS-V Coupe. The new Cadillac Concept Car will be revealed at a private reception August 15, followed by public display over the next three days from 9 am to 6 pm. 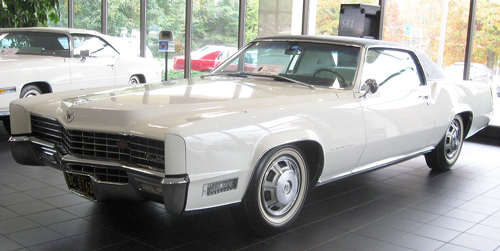 Joining the concept at the Peter Hay Hill exhibit will be three classics from the golden age of Cadillac, including the singular 1967 Eldorado (an example pictured above), along with a 1965 Coupe Deville, and a 1937 Series 90 V16. The already sold-out event titled The Quail, A Motorsports Gathering will feature Cadillac’s V series and Vsport vehicles. They will compete for attention with classic Ferrari 275 GTB models and the Aston Martin DB4 and DB5 GT also on display. Maybe this new concept car is an attempt to get a Cadillac into a James Bond film – if so we wish them good luck. Our attempts to get even a partial glimpse or further info on the new Cadillac Concept Car only resulted in the quote from David Campbell above. The auto industry seems to have picked up a penchant for secrecy from the films – or perhaps the world where the competition to sell automobiles and drive shareholder profits has grown quite intense. Nevertheless, it once again seems Pebble Beach would be a nice place to visit this weekend.